Magical lights and a holiday tradition. Nov. 29-Jan. 5 (closed Dec. 24). $6-$12. See the Zoo transformed into a colorful winter wonderland with over 700,000 lights. The holiday spirit comes aglow in this magical world of dazzling 3-D animal light displays. A 100-foot giant octopus, sparkling walruses and polar bears, shimmering Mt. Rainier. Camel rides, a vintage carousel and some new surprises await you at Zoolights 2019. Meet a meerkat. Stare at a shark. Ride a camel or a carousel, see new displays or revisit old memories. Instead of waiting in line, buy your tickets online and scan your tickets at the front gate turnstiles and walk right in. A Combo Pass includes daytime admission and Zoolights admission, and is a great way to see the new Pacific Seas Aquarium, which will be open during the day but closed during Zoolights. Combo Passes are available only at the front gate, and you can upgrade a regular Zoolights ticket to a Combo Pass there. Visit the Zoo by 3:30pm to see polar bears, penguins and more. The Zoo closes at 4pm, but with a Combo Pass you are invited to stay inside the Zoo and visit the carousel, cafe and gift shop. Zoolights opens at 5pm. Be among the first to see the lights that night and beat the crowds without having to wait in lines! Parking is limited, so plan ahead and share a ride with family and friends. Our camel rides are weather-dependent. Check at the front gate during inclement weather. Our Plaza Cafe is always open for dinner, drinks and snacks. The Pearl St Grille, near Camels, is open peak times only. Other stands for snacks and drinks are open around the Zoo. Point Defiance Zoo & Aquarium is teaming up with Girl Scouts of Western Washington again this year on the holiday lights recycling program. Working together, we hope to keep thousands of strings of lights out of the landfill. Plus, all proceeds from the 2018 Holiday Lights Recycling Program will fund shark conservation. Bring your old lights Nov. 29 through Jan. 12. Please remove all packaging, twist-ties and rubber bands. Please place lights directly in the bin with no bags or other extra material. Please drop your unwanted holiday lights in designated bins at the Zoo’s main entrance or these other locations. Looking for the perfect gift idea? We’ve got you covered, from shark dives to tiger plushes, gift memberships and so much more. 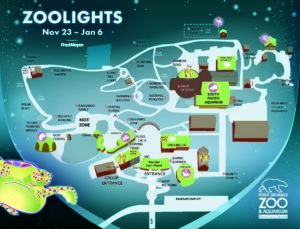 Find all your favorite displays on the Zoolights 2018 map! Need to know about strollers? Combo passes? Guests? And is Zoolights walk-through or drive-through? Find everything you ever wanted to know on our Zoolights FAQ page. See both Zoolights AND the Pacific Seas Aquarium (only open during the day) with a Combo Pass. Arrive before 3:30pm and upgrade your regular ticket at the gate.